김성용, 김현근, 안성익,(2018).구성원의 상사후원인식에 따른 자기주도 직무설계(Job Crafting) 행위가 조직시민행동에 미치는 영향.대한경영학회지,31(7),1409-1428. 전통적으로 직무설계는 top-down 방식만 고려되었으나, 최근에는 작업자가 스스로 자신의 특성과 여건에 맞게 직무설계에 참여하는 방식인 자기주도 직무설계 행위에 대한 관심이 높아지고 있다. 이에 대한 학계의 관심이 매우 높은 편이지만, 아직까지 이에 대한 실증연구가 풍부하지 않은 편이어서, 본 연구는 조직연구에서 대표적으로 사용하는 변수를 활용하여, 자기주도 직무설계 행위의 결과요인과 선행요인을 실증적으로 살펴보고자 한다. 본 연구는 결과요인으로 경영학 학계의 대표적인 행위성과를 의미할 수 있는 조직시민행동을 연구모델에 포함하였고, 선행요인으로는 상사후원인식을 포함하였다. 이에 대한 실증연구를 진행하고자, 국내 대기업 구성원들로 하여금 477부의 설문자료를 수집하였고, 구조방정식모델을 통해서 변수들 간의 관계 효과를 검증하였다. 분석결과를 대략적으로 요약해 보면, 통계적으로 상사후원인식은 예상대로 자기주도 직무설계 행위 및 조직시민행동에 긍정적 효과를 보였다. 주목할 점은 상사후원인식이 조직시민행동에 미치는 효과보다, 자기주도 직무설계 행위에 미치는 효과가 매우 강한 것으로 나타났다. 또한 여타 변인들 간의 관계보다, 자기주도 직무설계 행위와 조직시민행동 간의 관계가 매우 강한 것으로 나타났다. 종합해보면, 개인의 자의적인 선택에 따른 직무 수행 결정권의 긍정적 효과가 실무에서도 매우 큰 것으로 입증되었다. 마지막으로 자기주도 직무설계 행위는 개인의 심리적인 안녕과 더불어 성과를 동시에 강화할 수 있는 해법이자 전략이고, 이에 대한 이론적 및 실무적 논의를 제시하였다. Taylor opened the modern management with his principle of scientific management, which can be summarized as the proper way to utilize the work. To achieve the goal, he suggested analysis of work activity and job-design on the assumption that management knows the best ways to complete the works. Taylor system increased productivity dramatically. Hence top-down job-design has been adopted till recently. Of course, there was new approach for job-design. 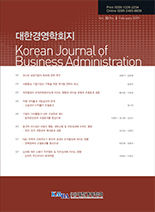 For example, Hackman and Oldham presented new way to job-design, which is known as job characteristics theory and emphasize enhancing works’ intrinsic job motivation by job-design. In that their approach emphasizes the aspects of job that are opposite to Taylor’s idea, it seems different from traditional job-design. However, in that it is also done in top-down way, they are not different totally. Recently, new changes in job-design are being found. The interest in Job crafting is increasing, which is different from traditional job-design in that the workers themselves design and customize their job. Hackman and Oldham, although introduced the core job characteristics that stimulate works’ intrinsic motivation, believed that these kinds of job-design should also be done by management and the workers should follow the results of top-down job-design. However, recent fast development of technology cannot promise the assumption that management know how to work better than the worker themselves. Furthermore, from the perspective of self-determinant theory, it is better to enhance motivation for workers to determine the way to work. On these backgrounds, the more researchers get interested in job crafting. In spite of the increased interest in job crafting, the empirical researches that unveil its consequence and its antecedents which were argued conceptually do not seem to enough. Accordingly, we designed research model that includes organizational citizenship behavior as its consequence and perceived supervisor support as its consequence and tested it empirically. The theories about job crafting argue that job crafting may increase intrinsic motivation and the increased motivation is expected to increase OCBs that require employees’ extra efforts. On this theoretical background, we tried investigating the effects of job crafting on OCBs. In the situation of job crafting, compared with traditional top-down job-design, the employees feel more responsibility about the performance because they designed their job. As the increased feeling of responsibility is expected to suppress the willing for employees’ job crafting, additional condition for job crafting seems to be required. Therefore, we expected that the sense of supervisor’s support will reduce employees’ feeling of uncertainty originated from job crafting and included it as antecedents in the model. For the empirical test, we collected data from employees belong to Korean large sized companies and include 477 questionnaires for the empirical analysis. We conducted confirmative factor analysis with structural equation model and reliability test with calculating Chronbach’s alpha before hypothesis test. To test our hypothesis, we conducted structural equation model analysis. The results showed that perceived supervisor support had positive effect on job crafting and job crafting had positive had positive effect on OCBs. One thing that seems interesting in results is that the effects of job crafting on OCBs is larger than the effects of perceived supervisor support on OCBs Combing the results, we can say that the motivational effect of job crafting is stronger than that of perceived supervisor support. On these result, we discussed theoretical and practical implication.